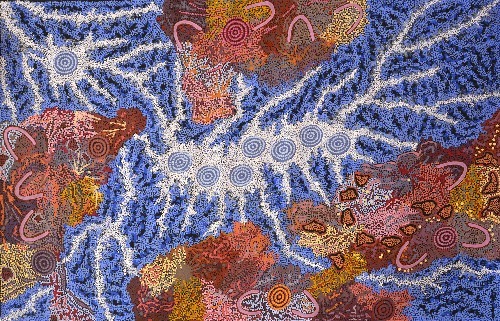 Most of Aboriginal artist Polly Ngale's paintings are centred around the 'Bush Plum'(or Conkerberry tree). She also paints her country, usually via a complex concentration of her finer dotting technique. Pollys works range from extremely fine dotting techniques with either interspersed colours or areas of varying colours and depth all blending together across the canvas. Through extensive overdotting, she builds up layers of colour, blending or separate, to give a wealth of different and very attractive paint effects. 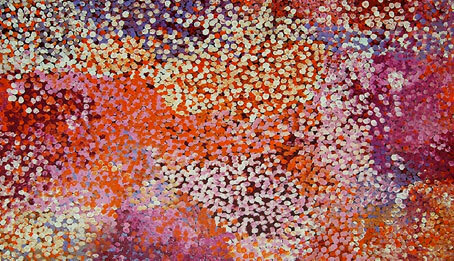 In paintings where she uses her large dotting technique, the style blends with the Dub Dub technique favoured by her relative, Emily Kame Kngwarreye. The Bush Plum which is central to many of the Aboriginal Artists' works provides an important food source for the Anmatyerre people ;and is frequently featured in the Women's dreaming stories. The fruits are harvested by shaking the trees until they fall to the ground but the fruits, although already quite sweet, need to be soaked in water to soften and plump them for eating. The Bush Plum tree flowers in Spring and many of Polly's paintings have a distinctly Springtime air to them - one can readily sense a host of blossoms in her works.